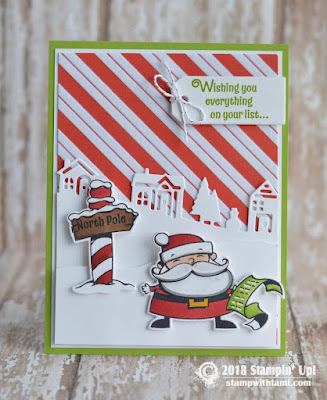 Here is another card from fellow demo, Tami White. She posted this card on her blog and it's just super cute! I absolutely love the new stamp set, Signs of Santa, from the new Holiday Catalogue. The card also uses the Santa's signpost dies and Santa's Workshop DSP (which just happens to be fuzzy)! The houses in the background were created using the Hometown Greetings edgelits and the cute little tag is from our Christmas Tags die. So how much do you love this card? A shout out to Tami and Veronica for this super adorable card! Show me your creations on my Facebook page, or in the comments below.